Confluence of Danube and Morava river. Watching the shear flow on Elbe river the other day, I was reminded of another shear flow which I had watched a long time ago. 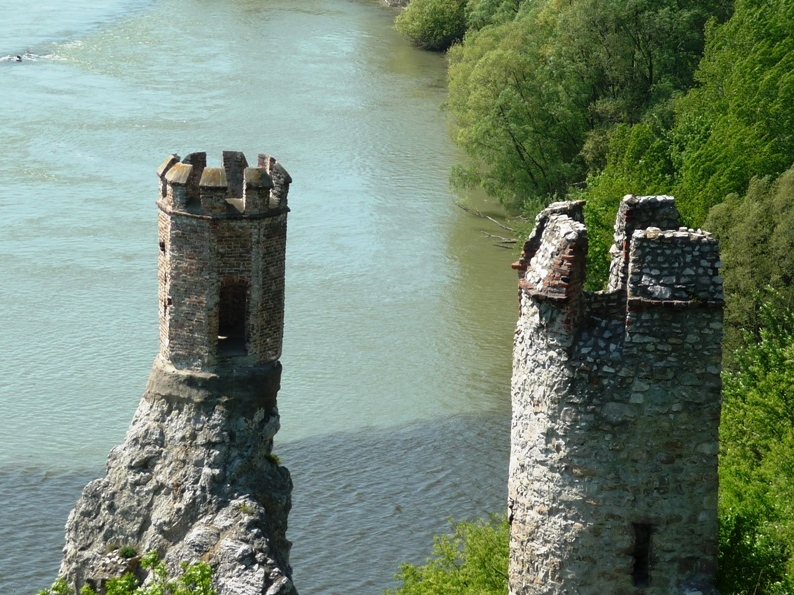 In 2009, J and I went to Bratislava in Slovakia, and from there did a trip to Devín castle. 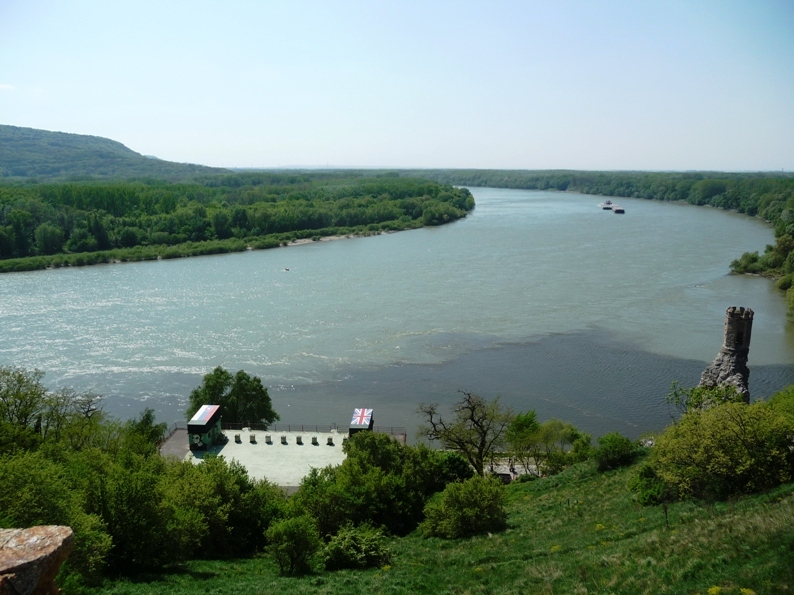 What you see below is the confluence of the Danube and Morava rivers (with the muddy water coming in from the right). I found it fascinating to watch the muddy water coming in, and then being forced downstream by the much faster flowing Danube. 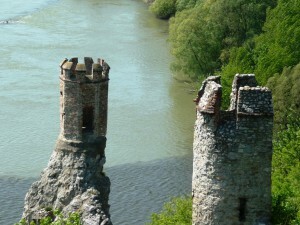 In the picture above you can see the sharp corner and then the front carrying instabilities caused by the strong shear. Fascinating how such a sharp feature can persist! Both in almost stagnant water (wouldn’t boats going through, or fish, or something mix it up?) as well as fast-flowing (there are clearly huge instabilities on the front, why don’t they mix more efficiently?). Plus the muddy water should warm up faster than the green-ish water, so why doesn’t the muddy water form a surface layer, at least in the stagnant part? This entry was posted in observation and tagged front, instability, shear flow on March 4, 2015 by mglessmer. 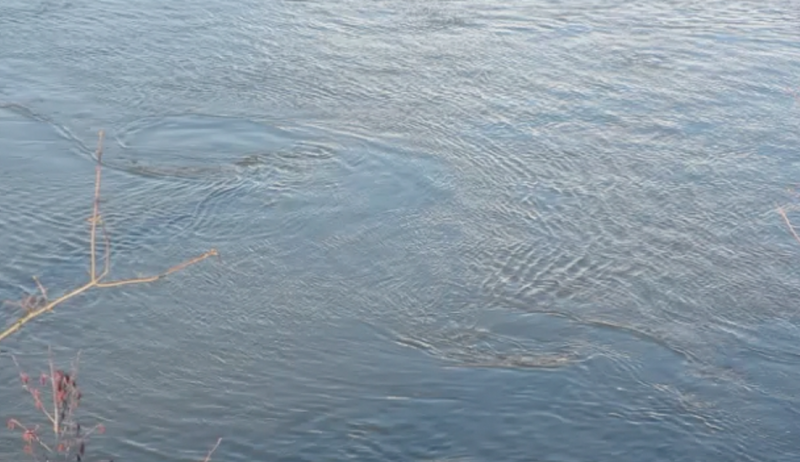 Kelvin-Helmholtz instabilities in a shear flow in Elbe river. On the picture below you see Kelvin-Helmholtz instabilities. They might be kinda hard to make out from the picture, but there is a movie below where they are a bit easier to spot. Anyway, this is what they look like: Kind of like the ones we saw off Jan Mayen in 2012. 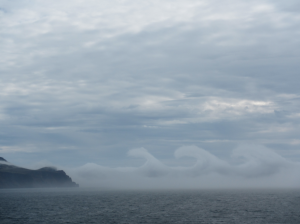 Kelvin-Helmholtz instabilities occur in shear flows under certain conditions. And those conditions could be explored by using a tool like Elbe. 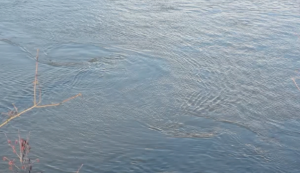 And once students get a feel for the kind of shear that is needed, why not try to reproduce a flow field that causes something similar to the instabilities seen in the movie below? This entry was posted in observation and tagged eddies, Elbe, instability, Kelvin-Helmholtz instability, shear flow on March 2, 2015 by mglessmer. A photo of internal waves in the atmosphere. Internal waves exist on the interface between fluids of different densities. In the ocean they are mostly observed through their surface imprint. In the tank, we could also observe them by looking in from the side, but this is hardly feasible in the ocean. But luckily vision is easier in the atmosphere than in the ocean. On our research cruise on the RRS James Clark Ross in August 2012, we were lucky enough to observe atmospheric internal waves, and even breaking ones (see image above). This is quite a rare sight, and a very spectacular one, especially since, due to the low density contrast between the two layers, the waves break extremely slowly. It is really hard to imagine what it looked like for real. This movie shows the view of Jan Mayen – the volcano, the rest of the island and then the atmospheric waves. Please excuse the wobbly camera – we were after all on a ship and I was too excited to stabilize properly. This entry was posted in demonstration (difficult), observation and tagged atmosphere, breaking waves, clouds, GEOF130, instability, internal waves, Kelvin-Helmholtz instability, meteorology, my photo, oceanography, RRS James Clark Ross, shear flow, story, teaching, waves on September 23, 2013 by mglessmer.